The Forgotten Glen is a view through an unknown glen to the mountains on the horizon. The foreground has plenty of impasto (thick oil paint) giving the painting a highlighted sense of depth. The Forgotten Glen is based on a glen that I visited in Scotland by accident. I drove out to look for a new location and ended up getting a little lost due to a failure in phone reception and in turn affecting my GPS. I took a photo of this view but when I got back, couldn't work out where on earth it was! It still remains a mystery to me today. I wanted to create a painting that conveyed a deep sense of depth and space and that would serve as a reminder to me and a story to others. I feel the story behind a painting is a really important aspect to it that can become a talking point when someone takes an interest in the work. This is another painting that is done on one of my Large canvases and for that reason, combined with the subject matter, this picture is impactful. 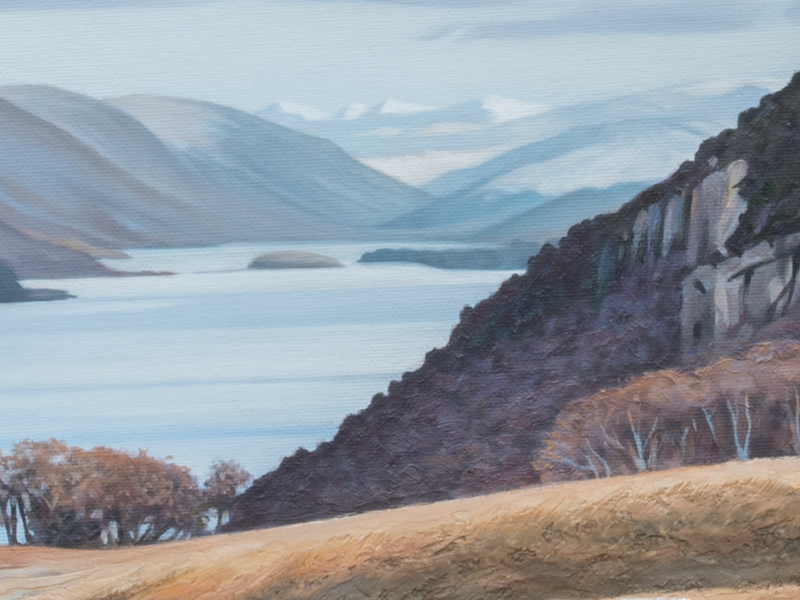 I continue to enjoy working with atmospheric perspective (how colours fade into the distance and create depth) as well as further developing techniques for a textured foreground. This painting feels quite grand in the sense of scale and has a fairly moderate temperature. The composition sweeps you into the painting, holds you at the mountain face in the midground before letting your eyes drift off into the distance. An impactful painting with a careful baclance between land and sky.